WISE aims at developing an innovative multidimensional assessment framework for Higher Education Institutions to better track students and understand and anticipate their needs. The project tries to define and deploy more and better “student-centred” services and solutions. WISE will develop an innovative and pan-European methodology to define, monitor and support “student welfare” to track students and enhance the social dimension of Higher Education. WISE supports the realisation of Erasmus+ Programme as a Strategic Partnership that will “develop, test, implement innovative practices and develop quality students’ counseling and support services to increase participation in learning and employability” (Priority 10, pag. 95, Erasmus+ Guide, Part B). Also, WISE addresses KA2 Strategic Partnership specific objectives 7 and 8 (pag. 95, Erasmus+ Guide, Part B) as it “improves capacities of HEIs for equity, inclusion, qualitative and targeted activities for specific groups”; and “fosters equity and inclusion in education to enable quality learning and prevent drop-out”. WISE is poised to improving HE performance and reduce recurrence of drop out, directly contributing to the EU2020 targets for Education of at least 40% of 30-34 year-olds completing HE. WISE addresses the needs identified by the “Agenda for Modernisation of EU HE Systems” COM(2011)567Final by allowing “tailored guidance to inform study choices and reduce drop-out” by allowing HEIs to better identify and respond to students’ needs. WISE is in line with the Strategic Objective 3 of ET2020 “Promoting equity, social cohesion and active citizenship” as it promotes inclusive education to ensure that all learners (including disadvantaged backgrounds) complete education, thanks to increased capacity to respond to students’ needs and priorities, shifting the focus from supply driven education to student-centred approaches. Among policies that affect Higher Education Institutions (HEIs), the Bologna Process has transformed the face of European Higher Education (HE), defining the European Higher Education Area (EHEA). 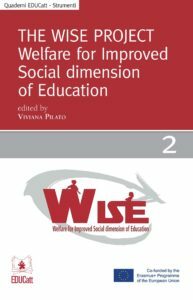 Against this background, WISE (Welfare for Improved Social dimension of Education) has developed an innovative multidimensional assessment framework for HEIs to better track students, understand, anticipate their needs, to define and deploy more, and better “student centred” services and solutions. This report is structured as follow: the findings of the first part of the WISE project are presented following the structure of the key takeaways presented above. The second part of the findings come from focus group realized by the international partners involved in the WISE project. Finally, a second part of the project has been conducted, only in Italy for EDUCatt. The second phase of the WISE project was aimed at assessing the impacts of welfare services on the satisfaction of students’ welfare needs. To achieve this aim, a quasi-experiment was designed and implemented. EDUCatt implemented a set of welfare services for students on the four campuses (Milano, Roma, Piacenza, and Brescia) of the Università Cattolica del Sacro Cuore and assessed the subsequent changes in students’ satisfaction.